This is a guide for anyone wishing to put on a show with NWTC. It is not a definitive rule book as each production works slightly differently. However, there are some basic procedures to be adhered to which are listed below. This document builds on the previous “production manual” and is a continual work in progress. Please also read the comprehensive “Stage Manager’s guide” to get further information. If you feel something could be amended let us know (chair@nwtc.lu). There are many members who are happy to support the Club by chatting with you about any aspect of putting on a show (see members supporting the Club). The Committee is also happy to direct you to additional help. In addition, at the end of the document there are links to various resources and examples to help you. Stage 1: Research of idea up to proposal - taking your idea and, in light of your vision, investigating the performance rights, potential dates, budget requirements, venues and required team then submitting a proposal for consideration by the Committee. Stage 2: Accepted proposal up to casting – organising and running auditions, finalising contracts (for venue, performance rights, NWTC membership for participants and any special sponsorships) as well as ordering scripts. Stage 4: Show through to completion of production – organising the get in, run of show and strike at venue as well as post production requirements (e.g. return of costumes, organisation of party, DVD showing, raising and chasing final invoices and finalising income, expenses and completing budget, calculating and following through on performance rights payments and providing feedback overall). (i) Idea and vision: if you like the idea of directing a show it might be worth speaking with as many people as you can about their experience of doing this (on the NWTC website there is a list of previous directors and also a list of members supporting the club who are happy to talk with you about specific aspects of putting on a show). This may help you to further form a clearer vision of your idea. (ii) Research stage: there are several things you need to research before preparing your proposal. Performance rights: Prior to putting time and energy into any other aspect of a production, it is worth while checking if the performance rights are in fact available for the play and, if so, roughly how much they will cost. If you have the script in a bound form, look on one of the first pages, where you may find information on how to obtain performance rights. Initial contact should be with the rights holder (often Samuel French Ltd, whose international connections should ensure that you are in communication with the correct agency). You should not make assumptions about the agency responsible for granting the rights. You will often need to send information (proposed dates, venue, audience capacity, information about NWTC) to the agents in order to be given an answer to any request for performance rights. In addition, explain that the play will be performed in English. Ask if there are any specific restrictions attached to the play. You may have to re-contact the agency, sometimes several times, and you may be referred on to another agency, which may then refer you on to someplace else! Potential dates: There are many factors to consider when choosing dates. Sometimes, the decision is made for you by the dates available at the venue which you desire to use. Obtain all school holiday dates for the year in which you plan to perform the play. Public holidays should also be taken into account. Try to avoid clashes with community events. Aside from other anglophone theatrical events (e.g. check with Pirate Productions, BGT and Actor’s Rep) it is helpful to consult community websites (e.g. www.chronicle.lu, www.wort.lu/en and www.delano.lu). Some employees of the European Parliament in Luxembourg often travel regularly to Strasbourg for the European Parliament sessions. It may be beneficial to obtain the dates of the “Strasbourg weeks”, and bear them in mind when considering the dates of your production. Expected costs/revenue (budget): This is one of the key areas when planning and running a show and as such is always considered a ‘living’ document. The budget is a formal estimate of the income which is anticipated, together with a realistic estimate of what will be required by way of expenses. This will require some investigation of the various elements and an idea of what the director and producer anticipate in the way of publicity (including printing costs), set, costumes, lighting, venue etc. Prior to production, clarify with the Committee regarding which production expenses are reimbursable. Please note that after approval has been given, any material deviation from the original budget must have further approval before incurring the expense. It is not appropriate, nor correct accounting practice, when a saving has been made on one budget item, to transfer that saving to another item where one would like to spend more money. In such a case, a request must be made to the Committee as in the previous paragraph. In addition, note that any expenditure on behalf of the Club which exceeds EUR 250, excluding items which have already been approved within a production budget, must be approved by the Club Committee before any commitment to the expense is made by a member of the Club. If approval is not given any expenditure in excess of EUR 250 will be assumed to be the responsibility of the person incurring the expense. It is worth investigating possible funding sources such as the “Fonds Cultural National” which provides grants for cultural activities presented in Luxembourg up to a maximum amount of EUR 1,250 a year. Normally, any grant is given to a group once per year only, although it is worth trying again in exceptional circumstances. Unfortunately since the austerity measures came into force, it has proved difficult to secure funding as NWTC is perceived as not needing help. However, please try! Venues: Find potentially suitable (in terms of location, size, availability and cost) venue(s) for auditions, rehearsal and performances. At the time of writing, NWTC does not own, or have any special arrangements with any one particular venue. Consequently each event requires an arrangement with a privately owned space. Please see the list of venues on the website but note that much of it is in the process of being updated. Team: Identify the key roles you need to fill and then ask people if they are willing to take them on. 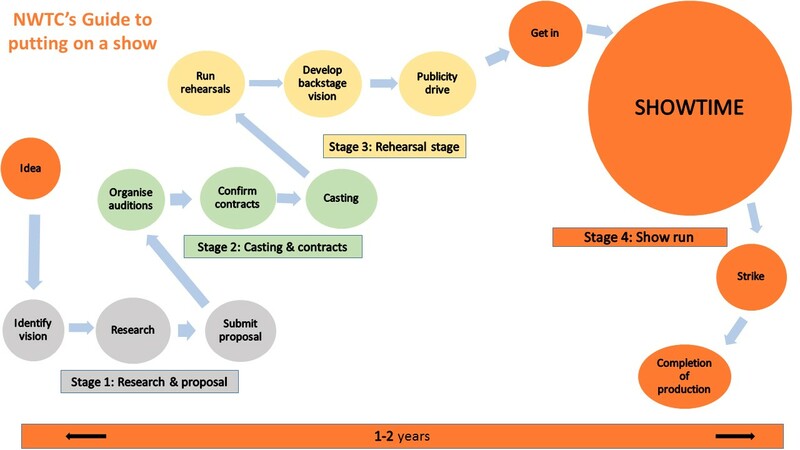 By the time you make a proposal you must have, as a minimum, secured the main team players (director, musical director, stage manager and producer) Others will need to be secured soon after, especially if you have very specific requirements (maybe for costumes, technical aspects, choreography etc). Speak with members on the list of “members supporting the Club” website page if you need advice. Vision: The vision element runs throughout the whole show and through every aspect. Whilst it will develop as the production progresses, it is helpful early on to have an idea of how you see the show being staged so others who assist can help you achieve this. It is perhaps really useful to have some idea of the sort of image a poster might have as it can be used on e mail shots, advertising, requests for funding etc very early on. Envisaged Committee and production support required: It is essential from the outset that any expectations a director/production team has of the Committee be discussed with the Committee. Similarly, it is equally essential that the Committee discusses its expectations of a director/production team with them. Communication needs to be open and constant. The aim of the Committee is to facilitate NWTC productions and events. Each year the work plan is full which results in Committee members being very much in demand throughout the whole year. Consequently, even though Committee members may wish to help, it does not automatically follow that they are able to become part of a particular production. If you seek individual support then please ask the member in question, just as you would any other production team member. Venue: The venue(s) for auditions, rehearsals and performances will need to be secured by having signed contracts in place. Although NWTC does not have any official contract forms, it is prudent to obtain a written and signed contract with the administration of the venue(s) for rehearsal and performance. It needs to cover the hire fee, due date for payment, dates venue required, any special conditions (such as use of theatre’s equipment or staff). Membership: All members of cast and crew of a club production must be paid-up members to be covered by the club’s accident insurance policy. It is possible to sign a disclaimer but not encouraged. Performance rights: see above. The performance rights’ certificate or contract should be held by the club Secretary, and be available for inspection at any time. Later on, if it turns out that any of these details are incorrect, simply contact the agency as soon as possible and provide the correct information. Sponsorship agreements (see above): Sponsors may require some kind of acknowledgement. Often this is that any publicity material for the show carries their logo. If you do secure sponsorship please be sure to ask the sponsor what is required and check with the Committee that requirements are compatible with NWTC policies. Plan and run auditions: NWTC runs open auditions for the casting of all Club productions. Advertise at least two dates and secure a venue. Audition forms: Applicants should complete a NWTC audition form (adapted by yourself to specific requirements). Secure the help of volunteers to organise auditionees and ensure audition forms are completed. After auditions, these should be forwarded to the Membership Secretary so that information can be updated on the database. Notification of outcome: It is essential that both each applicant and Committee are notified of the outcome of auditions. Communication of cast/crew contact details: It is really helpful to have a complete contact list for all cast/crew members. Be sure to have consent for sharing any personal details (if not already provided/completed on the membership form). Membership for successful auditionees: Once accepted, all participants are encouraged to become NWTC members (see membership above) and it may take time to chase these up. If they choose not to, you need to have a disclaimer form from them. (iv) Ordering of scripts: As soon as you know you can cast the show you can order the appropriate number of scripts. It is important to note that it is usually not permitted to photocopy scripts, this being a breach of copyright. You must therefore ensure that a sufficient number of scripts are ordered. (i) Rehearsal schedule: The director/stage manager must produce a basic rehearsal schedule for the entire run and make sure it is communicated to all cast/crew members as well as posted on line (a rule of thumb is a minimum of 100 hours rehearsal for a full-lenth play - see planning a rehearsal schedule for guidance). As the process develops it may be necessary to make more detailed schedules – these should be communicated and updated on a regular basis (ie. beginning of each month). The production team must keep the schedule updated as the run progresses. (ii) Further develop backstage vision: Regular contact between the director, stage manager and production team will be essential in order to fully develop lighting, sound, costumes, props, makeup, publicity etc. Pre-recorded music and any special effects can be sourced/created. The budget will need to be revisited on a regular basis and should any unforeseen costs appear, committee consultation will be required. Some resources are now catalogued (such as costumes and wigs) and can be found on the NWTC website. (iii) Run rehearsals: As so far as it is possible/reasonable, it is good practice to only call people for the relevant rehearsal time. It is important to respect the crew and cast’s time as well as the director’s. Wherever possible try to keep a pattern to the schedule. Try to organise water during rehearsals and remind cast/crew to bring food if they wish/require it. Provide opportunities for socialising during the rehearsal run (not necessarily the rehearsal itself) to allow people down time and time to express any concerns/hopes they have which cannot be addressed during rehearsals due to time constraints. (iv) Publicity: Although this will have been ongoing throughout the run, mid-way through the rehearsal period it really kicks in. Coordinate and amend the current publicity plan (contact chair@nwtc.lu for up to date list) according to your production and update the budget with printing costs. (ii) Showtime: Ensure cast and crew are clear about arrival times (allowing for makeup/warm ups etc). See if cast or crew need sandwiches available and if so, agree price and encourage people to organise themselves. Arrange for water to be available. Arrange a rota to check changing rooms are left in tidy and reasonable condition after each performance. (iii) Strike: All hands on deck. Decide when strike to take place (if after show then before any celebrations), if next day, arrange time etc. Organise who does what. Get set/props back to barn. Venue must be left in clean and organised state. Costumes: Arrange for cast to clean costumes and organise future date for collection. Party: Organise and plan a cast/crew party. Presents are often exchanged and crew’s work in particular needs to be acknowledged. DVDs: Celebrate the show by sharing the DVD. Expenses: Please submit all requests for reimbursement, with receipts wherever possible, to the treasurer no later than 6 weeks after the production. If possible, submit requests as they occur. Performance rights: Calculate and request Treasurer to pay performance rights. Outstanding expenditure and/or income: Raise any outstanding invoices and obtain any outstanding monies as quickly as possible. Finalise and close budget and send to the Committee. Feedback: Try to ascertain what worked well and what might be done differently in future. A report is not essential, but can be useful for yourself but also future directors, producers and Committee members. Rehearsal planning - how many hours?